Sigismund Schlomo Freud was an Austrian neurologist and the founder of psychoanalysis, a clinical method for treating psychopathology through dialogue between a patient and a psychoanalyst. He qualified as a doctor of medicine in 1881 at the University of Vienna. Upon completing his habilitation in 1885, he was appointed a docent in neuropathology and became an affiliated professor in 1902. Freud lived and worked in Vienna, having set up his clinical practice there in 1886. In 1938 Freud left Austria to escape the Nazis. He died in exile in the United Kingdom in 1939. More about him and his career here. Information from his Wikipedia page. Welcome to the social chameleon and show, where it's our goal to help you learn growing transform into the person you want to become. Before we get started today, like the little disclaimer, you're listening to this with children. People that are sensitive to adult topics and subjects, we suggest you save this for later or skip it altogether. This book talks a lot about adult behaviors and topics that may not be suitable for sensitive people. 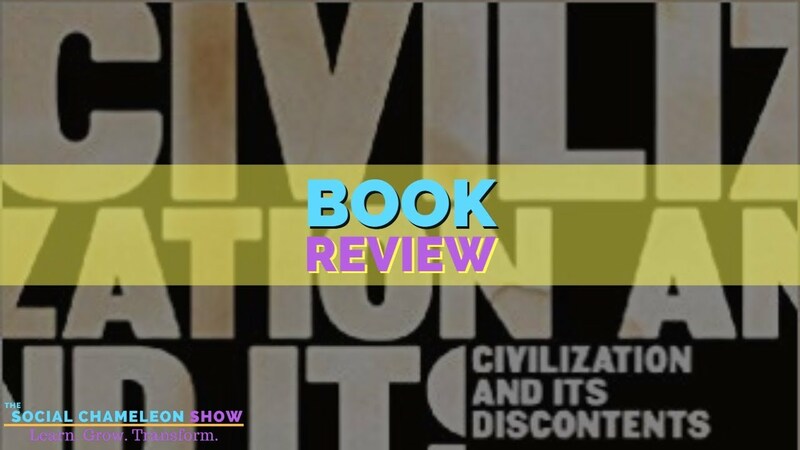 Yeah, but the book we are reviewing today is a civilization and it's on this connections by Sigmund Freud. I'm a little bit, if you guys don't know, sue me for. I like to think of him as like the godfather of psychology, a little. He was a psychologist, a medical doctor, and the father of psychoanalytic and is generally recognized as one of the most influential and authoritive thinkers of the 20th century. He was a Austrian neurologist and the cofounder of the Psychoanalytic School of psychology. There's a lot of words to know all that good stuff. I just kind of know from, I guess my college days, you take psych one on one or whatever and it's like, Oh yeah, 10 room you're talking about. Freud and this is kind of cool him alongside with Rogers and Maslow, those are some of the psychological godfathers, right? Yeah. It's all good stuff that they put out unless even holds true to this day, which is really surprising on the science stuff that seems to evolve and evolve and evolve, but these things really seem to hold true. Yeah. Um, it, it's interesting, right? Because I think we were talking about it the other day, like this book was written almost a century ago. The pdf copy I was able to get ahold of was in 1930 when it was first published and translated from German. And you have the hard copy book was from the sixties. Yeah, from the sixties. Yeah. So I mean that's was in here. So even when I was thinking, I was like, when did he write this 25, you know, when did this start in 19, 20, 1910? When did this research. You can start like, who knows, right. It's no idea. No, I'm looking at at least eight, you know, 90 year old text. Yeah. That's Kinda cool. I guess that's a, that's something the dive into, but anyway. Okay, so about getting into the whole review of it or whatever. I kind of took away from the book that I guess basically I'm Sigmund Freud's talking about the unhappiness of men per se. Then basically it's kind of weird that he's, I don't know if it's a premise or whatever on and off, you're a college student or a professor like don't kill me. I don't have my doctorate in psychology or whatever. I'm just kinda taking away from the books I've read and the things that I've seen in life, but you know, my premise or take on the book is that he's saying that a man has a lot more tendencies to be unhappy in life. Men Happy. He even goes into the whole thing of like pursuing happiness and ways to go about that and he talks basically is civilization as, as you could say, quote unquote like technology that man has created, right? We've created civilizations to try and overcome this unhappiness that we have inside and in book kind of talks about, I guess the duality of that. Right? Like we as men want to conquer things and be part of ourself and civilization helps with that, but in many ways that also takes us away from our being itself. Just kind of I guess contra intuitive. Something like that. I don't know. Is that kind of Karma to got out of the book?